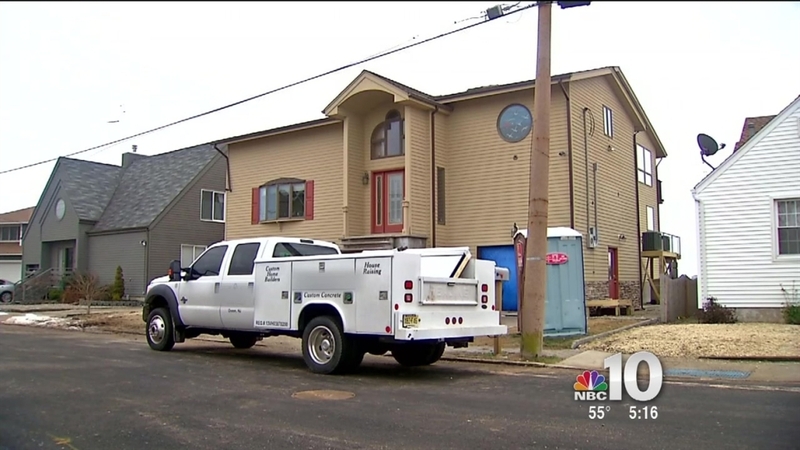 More than three years after Hurricane Sandy devastated New Jersey, thousands of homeowners are still feeling its effects. According to data obtained and analyzed by the NBC10 Investigators, just more than one out of every three homes has been fully rebuilt in the state’s largest recovery initiative. NBC10 Investigative Reporter George Spencer spoke with three residents who -- a full 40 months after Sandy -- are still waiting for their homes to be completed. Penny Ryan of Little Egg Harbor Township showed Spencer her front door, which sits well above her head but has no stairs. The backyard where her six children played remains a mud pit. “We continue to come back every single day – and it’s a reminder, every day, that this occurred. And we’re still living in it. We’re still living this devastation,” Ryan said. On Pelican Island, adjacent to Seaside Heights, Sue Kosakowski’s retirement dream is also still not rebuilt. Neither is Lori Tyska’s home across the street. “I just feel almost hopeless. Almost hopeless,” Tyska told Spencer. Each of the three women is frustrated by the pace of the recovery, and by public claims seeming to indicate the recovery is complete. At his last presidential debate, Governor Chris Christie exclaimed that the state had recovered. “And when the worst natural disaster in your state’s history hits you, they expect you to rebuild their state, which is what I’ve done,” Christie said. The NBC10 Investigators dug into the data for New Jersey’s largest recovery initiative: The Reconstruction, Rehabilitation, Elevation, and Mitigation (RREM) Program. The program either reimburses homeowners for repairs or pays contractors directly for the work. Fire Chasers: Helping or Hurting? We found 7,774 RREM grant agreements have been signed since the October 2012 storm. Yet, only 2,774 RREM homes have actually been re-built, which is about one out of every three approved projects. The NBC10 Investigators also confirmed that more than 600 of those projects were just finished in the last quarter of 2015. Ryan says her case was slowed because RREM was unprepared for the contractor fraud she suffered. The first crews at Tyska’s house didn’t correctly repair her foundation. Tyska says RREM wasn’t able to quickly find a new contractor to do the follow-up work, which left her home with township code violations in the meantime. Kosakowski blames her delays on inconsistency in re-building standards between RREM, her insurance, and the township. The RREM program is intended to help residents re-build, even despite such complications. Yet these homeowners say, inefficient and inadequate communication from RREM has often slowed repairs down further, and has occasionally added new hurdles. “They are not equipped to handle the scope of what Sandy brought to New Jersey,” Sue Kosakowski. After RREM representatives declined our on-camera interview request, we caught up with Governor Christie on the campaign trail in New Hampshire in February. Spencer then asked about the RREM program, but Christie walked onto his campaign bus instead of answering. The governor’s office never responded to our requests for a more complete interview. The New Jersey Department of Community Affairs points to other numbers, saying nearly all RREM grant agreements have been signed, and about 6,700 of RREM’s 7,700 participants have received a notice to proceed with construction. However, those numbers don’t reflect whether or not construction has begun. For the many in the still-unfinished group, frustration continues to grow. “It’s hard to explain what it does to you, but it actually gets to the fiber of your soul,” Kosakowski said. Kosakowski, Ryan, and Tyska are part of a group called the New Jersey Organizing Project. State officials say they’ve 'personally met and frequently communicate' with the group to address concerns. By May 1, 2016, New Jersey’s Housing Recovery Centers will be closed and consolidated into just two offices. Officials say that will allow them to focus more of their resources on rebuilding and project completion, which they say are now the “predominant needs” of RREM homeowners.